For more information about our Cable & Harness Assemblies click here to contact us. AMS Electronics is a small to medium volume, electronics manufacturer fully equipped with a complete selection of wire termination equipment and is staffed with trained and experienced personnel to handle all your cable connectivity requirements. From simple ground wires to complex interconnect multiple-termination harness assemblies. We possess the capabilities for your cable and harness assemblies using wire sizes from 30 to 2 gauge. Also a wide assortment of wire and cable types that are routinely used including coaxial, solid, stranded, metallic, multiconductor, braided, sheathed, and ribbon. 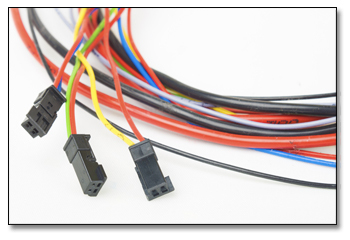 Our interconnecting wire and cable harness assemblies can deliver prototypes and handle production volumes for just about any wire or cable type. AMS is fully equipped with a complete selection of wire termination equipment including applicators, crimp tools and die sets, along with mechanical inspection and electrical testing equipment that ensures your finished product conforms to industry specifications and requirements. Whether you are in the industrial, commercial, transportation, consumer, or medical industries, AMS has the technical and manufacturing expertise for your application, simple or complex, to provide you with the highest quality cable and harness solution.